Business Intelligence refers to computer-based techniques used for learning, analyzing and predicting problems. Serving to eliminate problems before they arise, BI is the next critical step in today's world towards helping organizations to reach their goals. In this whitepaper, Deltek looks at this revolutionary platform for analyzing data, and focuses on its abilities to grant users with immediate, self-service access to data. 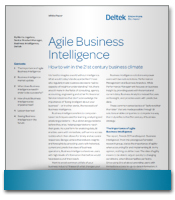 Noting its increasing prevalence in today's business structure, Deltek shows that BI is no longer just a beneficial option for successful companies—and instead truly reflects the 21th century of business strategy. Fill out the information below to read how BI can proactively transform your decision-making and enhance your business' agility in the upcoming markets.